Three siblings have had their stomachs removed after testing positive for a cancer gene following the deaths of their mother and sister. 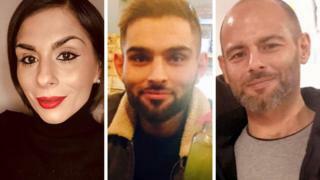 Tahir Khan, 44, Sophia Ahmed, 39, and Omar Khan, 27, underwent the surgery after a series of tests at Addenbrooke's Hospital in Cambridge. Their mother and sister both died from stomach cancer. The siblings, from Walsall, said the operation had saved their lives and "eliminated" the risk. However, Tahir's daughter has now been found to have the same gene. The siblings' mother Pearl Khan was 49 when she died 16 years ago, six months after she was diagnosed. Their 32-year-old sister Yasmin Khan died about six years ago. Tahir said: "We didn't even think about genetic testing at that time but Sophia was very tenacious and worked with Cancer Research UK to get us all tested." The screening and tests for all four of the remaining siblings, including their other sister Tracy Ismail, 49, took from about 12 months to three years. They identified three of them were carriers and each decided to undergo the operation as a preventative measure. Sophia had the operation first, followed by Tahir and Omar. Tracy, who was the only sibling to find out she did not have the gene, said: "They told me my results first, so I just thought we would all be the same. "It was very bittersweet. I was totally devastated. "At one point we were told that if we hadn't had the testing done, I'd be the only sibling left. "Knowing what my mum and sister had gone through and so quickly, I encouraged them to have the procedure done, and they're all still here." Sophia said: "I read in my sister Yasmin's notes in hospital that they thought it may be genetic so I did some research and found out the hospital in Cambridge was doing a study with Cancer Research so I contacted them and went from there. "Everyone thought I was mad until we had the results come back and when we saw it was three of us out of the four, I knew it was worth it." Sophia said she can "still eat and do everything" and added: "The only issue is maintaining my weight and my vitamin deficiencies but in comparison to having stomach cancer and a few years to live, I can't complain. "I even had a baby after the operation, they thought I might be malnourished or the baby would be tiny, but everything was absolutely fine." How can you have your stomach removed? Cancer Research UK said some tests are available for an inherited faulty gene that can increase the risk of developing certain types of cancer. Tests for gastric cancer can include a blood test and chest X-ray, faecal sample testing, an endoscopy, ultrasound scan and laparoscopy. A gastrectomy is the name of the procedure of removing part or all of the stomach. During the procedure, a small pouch is created by connecting the gullet to either the small intestine or the remaining section of stomach. This means that the patient will still have a working digestive system, although it will not function as well as it did before. For about two weeks after the operation patients are fed through a tube into the vein, but eventually will be able to eat most foods and liquids. However, people who have had the procedure will need to eat more frequently and smaller portions, rather than three large meals a day, and take vitamin supplements to get the right amount of nutrition. Now, the food the siblings eat goes into a "small pouch" that was made by connecting the oesophagus to the intestine. "I used to be 15st but now I'm only just over 10," Tahir said. "I have to graze constantly because my body just can't get the nutrients it needs otherwise. "My brother, on the other hand, he still eats like a horse." Omar has a different view of the procedure. He said: "At first after everything with my mum and sister I didn't want anything to do with hospitals or doctors or anything like that. "But seeing my Sophia go through the procedure and have a baby afterwards, I thought 'I've got no excuse'. "It was a really hard decision for me but it was the best one I've ever made. "I still can eat whatever I like - burgers, steaks - the only thing I get is exhaustion and cold sweats but I'm still breathing and I'm so thankful for that." However, Tahir's daughter, Farah, who is 21, has since tested positive for the gene too. He said: "I am worried about my daughter's future, but I say to her we have all gone through it and are fine now, so whatever happens she'll be OK."
Tahir underwent his surgery five and a half years ago after his test found he had clusters of cancerous cells in his stomach lining. "They said I effectively had cancer but because it was contained in my stomach lining and I had all that removed, it eliminated it. I could have had only days, weeks, maybe a year maximum left before I would have been diagnosed with terminal cancer. "There's no doubt in my mind that having the tests and the procedure done saved my life." Dr Marc Tischkowitz, consultant physician in medical genetics at the University of Cambridge, said: "This is a very rare, specific type of stomach cancer. "It's a gene that carriers can have for their lifetime and means that they are at risk of developing cancer any time." He said the stomach removal was "a dramatic life-changing procedure" and said there was "no way of knowing in all cases that the person who carries the gene will 100% have developed cancer in their lifetime". Georgina Hill, from Cancer Research UK, said: "It's estimated only 3-10% of cancer cases are linked to an inherited faulty gene. "Anyone worried about their genetic cancer risk should talk to their doctor, who can refer those with a strong family history of certain cancers to a genetic counselling clinic if appropriate."